For the past two days Internet connectivity in Libya has been oscillating on and off in a confusing yet systematic manner. Going down during the night, only to be restored minutes before sunrise amidst riots calling for the removal of Muammar Al-Gaddafi’s 42 year old regime. 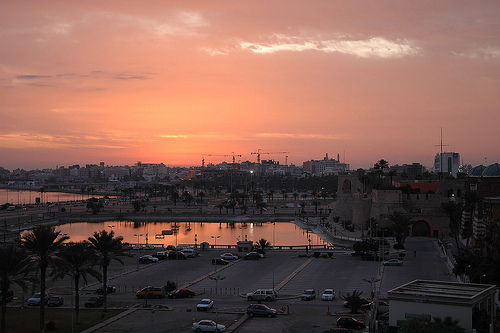 Monitoring the country’s connectivity shows that every morning at pricesly 05:30 AM GMT, the Internet is restored to the country, yet not entirely as websites such as YouTube, Facebook, Twitter and aljazeera.net are being blocked from Libyan users. Day one of the unrest resulted in a 6 hour lock-down of the Internet which was restored after sunrise, only to be severed again 22:00 GMT the same day and then restored again this morning at the same time, 05:30 AM GMT. The Internet blockage period remains a mystery as to why the Libyan regime has decided to only confine it to 6-8 hours of the night, perhaps to protect itself from the possible global uproar that resulted from Egypt’s famous Internet Lockdown continuously for 9 days almost 3 weeks ago. President Muammar Al-Gaddafi has spent the last 42 years as Libya’s de facto president since 1969. And as most Arab dictators is refusing to go down without spilling as much blood as internationally acceptable. Human Rights Watch reports of more than 104 killed so far in the riots that began two days ago on Feb 17 and have since spread to all Libya’s major cities while Al Jazeera reports of foreign mercenaries being brought in to quell the unrest. Time will tell whether or not brutality will save Libya’s dictatorship, unlike its former Egyptian and Tunisian counterparts.